Stayed as a house guest for Christmas 1985, but returned permanently not long afterwards when one of her original owners unfortunately became allergic to her. A chunky tortoise-shell and white, camera-shy Rixxa (pronounced Reesha - the Maltese for "feather"!) died of unknown causes on 29 January 1988. Black-and-white bicolour Sharez wisely voted with her paws in May 1987, and chose to move in with us rather than the less-attentive neighbours several doors along. Not long afterwards, she survived being knocked down by a car, which left her with a broken jaw, a bent nose (which subsequently caused her to snore noisily), and a permanently shocked look on her face. As this snap suggests, Sharez generally kept herself to her herself, and virtually went wild during the summer months, appearing - typically - only at meal times. She died on the morning of 27 March 1999 after a short illness. 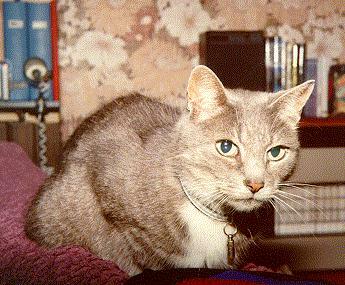 A mackerel tabby, Tyggy was found wandering around Chapeltown, Leeds in the Autumn of 1987. She was only a few weeks old at the time, and we were foolish enough to agree to look after her until we found, "a good home for her." Luckily, Sharez - who had had one litter before she moved in with us (although we never did find out what happened to them all) - effectively adopted her, and the two could often be found snuggled up asleep next to each other. She was stayed in Leeds with my mother when I moved to London in late-2001, and then adopted when she moved to Newcastle in mid-2002. Already something of a distinguished old lady, Sutekh appeared during a rain storm in late-1987, and demanded to be looked after. A single-cat-per-house feline at heart, she never took much to her new companions, but when it came to it, she could hold her own in a scrap. When I lived on my own for a year in 1988-89, it was Sutekh who stayed to keep me company, and with no competition she really revelled in being the sole centre of attention. She had some very strange tastes, including (plain) chocolate digestive biscuits and Walker's Quavers, but she was still an accomplished hunter. 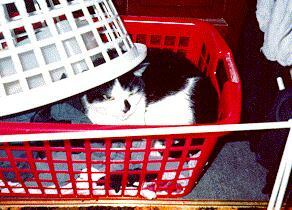 Despite this, she was one of the most gentle cats I have ever known. Sutekh died of gastroenteritis in the early hours of 3 March 1992. 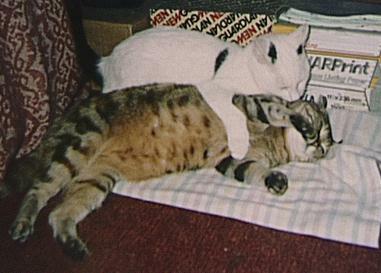 Akira (seen above wrestling with Tyggy) was rescued on 21 February 1992 after his previous "owners" moved house and left him behind. Despite a highly ineffectual camouflage of "white-with-black-bits" (effective only in snow, and then only just), Akira still managed to commit more than his fair share of atrocities on the local wildlife. He was stayed in Leeds with my mother when I moved to London in late-2001, and then adopted when she moved to Newcastle in mid-2002. So called because of the splodge of black on her nose which was virtually the only way to differentiate her from Sharez, Splodge was another ex-independent cat which Fate led to us in July 1994. 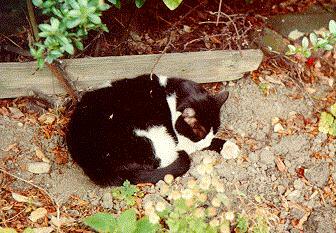 She was put to sleep on 10 August 1995 when her feline leukemia proved inoperable, but brought back home for a final resting in her favourite flower bed in the garden.